On Tuesday morning at 11:45, I ran out of my last final exam and plopped myself down in front of the nearest screen, determined not to miss a moment of Barack Obama’s inauguration. Televisions are harder to find around campus these days, but all I needed was a laptop with Internet access, and nearly everyone in the dining hall was congregated around one or another. During the last nine years, the growth of the Internet has changed the way the world seeks information. 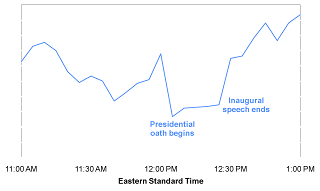 From President Bush’s first inaugural address in 2001 to his second in 2005, the number of inauguration-related searches increased by more than a factor of ten. From 2005 to today’s address, the number grew even more. Few of the 2001 queries requested “video,” and none requested streaming. By 2005, a few queries such as inauguration audio and streaming video of inauguration appeared. Today, technology has become so prevalant that queries such as YouTube live inauguration, live blogging inauguration, inaugural podcast, and Obama inaugural speech mp3 formed one-third of all inauguration-related queries. I wasn’t standing in the middle of an animated crowd, but watching a stream of my friend’s statuses placed me amidst an equally excited digital crowd. It reminded me of watching the debates while perusing the streams on election.twitter, and unsurprisingly, Twitter too was a flurry of activity on Tuesday. What do these changes mean for the Obama administration? For digital natives who are participating in this new world of politics? I don’t have any solid answers – if you have any insights, share in the comments! — but I would like to point to one thing: all the chatter surrounding the new White House website and blog. The simple fact that we care about whitehouse.gov is amazing enough. I can’t think of the last time I went the site before Tuesday’s redesign, and now we’re even analyzing the website’s robot.txt file. “Change has come to America” announces the White House website banner – true, where change will lead us remains to be seen. Last week, Sarah wrote about experiencing President Obama’s inauguration online. “I wasn’t standing in the middle of an animated crowd,” she wrote, “but watching a stream of my friend’s statuses placed me amidst an equally excited digital crowd.” For Sarah, watching the inauguration online was a fitting end to an ambitiously digital presidential campaign and transition; a way to experience a historic moment in the digital company of friends. 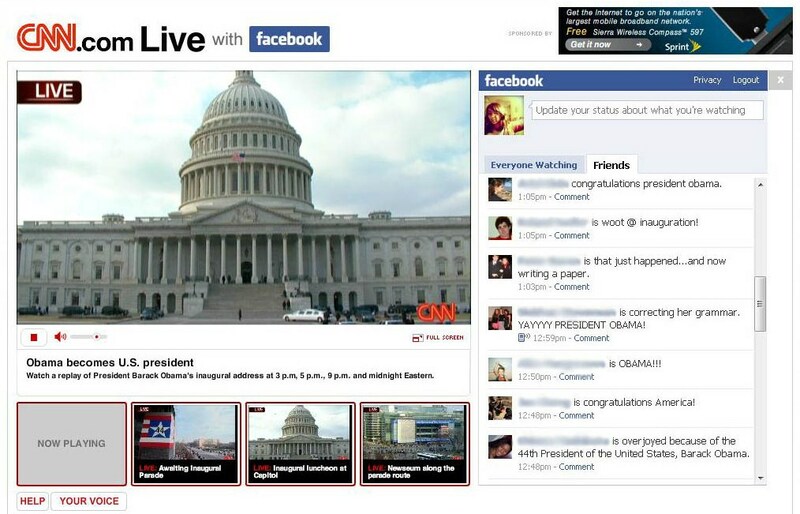 The screengrab she posted, of CNN’s live stream of the inauguration buffeted by friends’ Facebook status updates, tells one side of the story—the side where college students sit in their dorm rooms, watching up-to-the-minute footage; absorbing history as it happens, in a strange combination of visceral and vicarious experience. But what about the digital natives who were “really” there? How did they traverse the liminal zone between their screens and the scenes around them? Two indelible images from Inauguration Day involved young people with cameras, capturing history for instant posterity. It’s no surprise that digital natives would use technology to mediate their experiences, but seeing the mediation in action is confronting, inspiring, and somewhat curious. As President Obama took the oath slightly after noon on January 20, cameras were evident everywhere in the audience. But right there, at the very front, Malia Obama foreshadowed what it will be like to have two have two tech-savvy young girls in the White House. Even as her father was making history, Malia was focused on her tiny pastel camera, documenting the moment for herself. 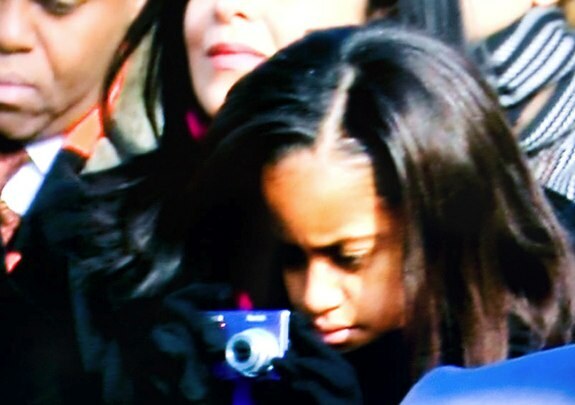 Incidentally, the photograph comes from an article on GearLive, in which the reporter revealed that Malia had been using a Kodak EasyShare M893 IS 8.1MP digital camera. Within minutes of Malia taking her own photographs, photographs of her with her camera were showing up on gadget blogs, complete with exorbitantly specific model information. A blog post from ABC News noted that “the first daughter is certainly not the first to document her experience at 1600 Pennsylvania Ave”; other White House residents have also followed the impulse. But the instantaneity of the Inauguration photography cycle served underlined the ubiquity of the impulse, and, more importantly, its ubiquitous expression. When even the president’s daughter experiences her father’s inauguration “through the viewfinder,” this perspective transcends lark and becomes a force in its own right. That force was in action again that evening, at a series of presidential balls. The Youth Ball saw the First Couple dancing “old school” to an instrumental version of “At Last”, but the crowd seemed not to see it at all. Unlike the sweet promise of Malia’s individual documenting impulse, there starts to be something almost sinister about the sea of outstretched camera phones that greeted the couple. No matter the meaning of the scene, though, the fact of it is remarkable enough. While millions of people were at home watching history happen on their screens, thousands of digital natives were right there, in the moment—watching history through their screens, too.